Having a beautiful, confident smile changes your life. When you know your smile looks amazing, your self-esteem blossoms and you’re comfortable talking and laughing with others. An incredible smile opens doors, set others at ease, and improves your oral health, too! Dr. Cynthia McNeill, along with our team, would love to help you achieve your best smile. We’ve been practicing leading-edge orthodontics in St. John’s since 2002, creating lasting, incredible smiles for our friends and neighbors. When you’re our orthodontic patient, everything we do is focused on you. Your comfort, needs, and goals are our top concerns. We treat every patient as we would our own family member, with compassion, respect, and professionalism. We’ll strive to get to know you on a personal level, looking forward to your visits as a time to hear your latest news and share a few laughs. Because orthodontic care usually takes several years, and we’ll see you regularly, we’ll build a lasting relationship with you. It’s a joy to spend our days helping our friends develop the smile they’ve always wanted. We look forward to doing the same with you. Straightening your teeth is making a positive, lasting difference in your life. We believe you should enjoy every step of the process. We’ve created an orthodontic office that’s filled with laughter and smiles, where our staff will support and encourage you. We’ll also teach you about your oral health. We want you to keep your incredible new smile healthy and beautiful for the rest of your life! If you’re an adult who’s always wanted a beautiful smile, we’d love to help. Today’s technology allows us to gently shift teeth, virtually invisibly. Your coworkers, neighbors, and friends won’t know that you’re having orthodontic treatment. They will notice, though, that you’re smiling a lot more often, and with greater confidence. Please contact our St. John’s, NL orthodontic office to schedule a visit for yourself or a loved one. 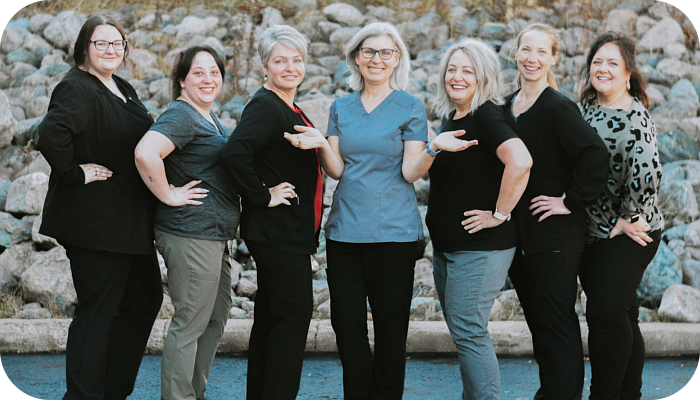 Dr. McNeill and our team members look forward to welcoming you to our practice. We’d love to help you develop the beautiful and healthy smile you deserve, one you’ll share with confidence. Call, today!